At a factory in Belgium, a new breed of products is being developed from the fibrous remains of sugar cane. It is a raw material with plenty of potential. Wim Van Rhijn, the General Manager of TransFurans Chemicals explains: “In the Dominican Republic we start from sugar cane. First the sugar is extracted, and then you obtain the bagasse. This is our starting raw material. 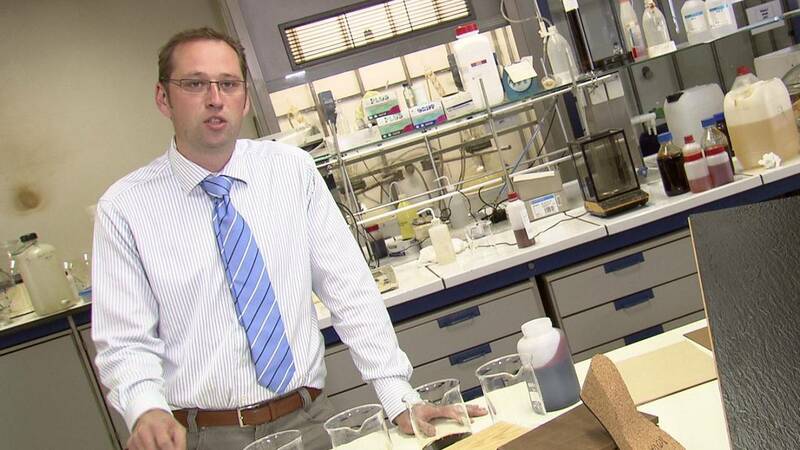 Hans Hoydonckx, the Business Development Manager of TransFurans Chemicals continues: “This woody material is cooked at a high temperature and from the cooking you get a pure chemical, and this is called Furfural, it smells like almonds. The bioresin made by TransFurans Chemicals aims to be a more sustainable and environmentally-friendly replacement for oil-based plastics. “The first example is the interior market,” explains Hoydonckx. “There we make decorative high pressure laminates. We also made components for the automotive industry, so this is also bioresin, moulded at high temperatures, but here we replaced the paper with a natural fibre. “The resin structure also reinforces textile and the textile still biodegrades, but much more slowly than this does. So you have several seasons of service life in a textile before it starts disintegrating into the soil structure. Here we actually replace standard thermoplastics like polyethelene,” adds Hoydonckx. This bioresin technology has been developed over the course of several EU research projects. Input and testing from universities has helped to create products that are ready for market. The next step is identifying the right sectors to target with your ‘new green materials’.